Jackie Chan Adventures In the dark of the night. JCA/LB: Which Emerson brother should be 老友记 with Jade? Whats your fav catch phrase? Who is your fav villain? Do 你 count drago as a demon sorcerer? Hoping someone on here can answer this. Which episode is the one where Uncle keeps saying One 更多 thing to Tohru and Tohru finally screams NO 更多 THINGS? 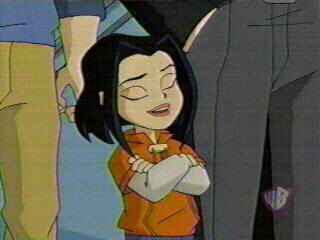 Should I 电子邮箱 the creator of Jackie Chan Adventures to continue the series? Later, as Jade, Jackie, Uncle and Tohru look on, shocked, Edgar and Alan then simultaneously say, “Do not touch us! We are, and shall remain, Princes of the Shadowkhan” (while ironically wearing their vampire hunting gear). Chow was playing the drums, Ratso and Shadowkhan the 吉他 and Valmont the cowbell, while Shendu was a stage prop. Finn swooped on stage as the leader, and won over the crowd. Then, all of a sudden, Jackie jumped down from a Section 13 helicopter and punched him in the face for no reason besides being “off key”. Oh, yeah. Story of my life. My name’s Jade Chan, and I’m thirteen years old. Sometimes I like being a Hollywood icon. Other times, it’s not exactly very glamorous. Usually the tabloids go crazy over me, probably because I have charm, and of course, charisma. However, like all celebs, I also find the “stalkerazzi” — as my celebrity 老友记 and I call them — kind of annoying. They make up all these stories instead of listening to and searching for cold hard facts. In my mind, Jade Chan is simply an inspiration. She really inspires me to write, as well as cook up some really neat stories about her as well. Case in point: Confessions of a Hollywood Celebrity. In Confessions of a Hollywood Celebrity, Jade is thirteen years old, and has been a 星, 星级 ever since she was eleven. She has to deal with all the things that most stars deal with: paparazzi, 文章 about her in the newspapers and magazines and having to deal with photographers that want her picture too. Luckily, she manages to keep herself on the straight and narrow. Basically, this is a video of Chow from Jackie Chan Adventures set to the opening theme from the TV 显示 Buffy the Vampire Slayer. Cool panoramics of distance shots and backgrounds used on the show! a poll 增加: JCA/LB: Which Emerson brother should be 老友记 with Jade? Which episode is this 照片 from?